The Gomidas Organ Fund, Inc.
was founded in 1970 by Berj Zamkochian as a distinctive way to mark the 100th anniversary of the birth of famed priest-composer Gomidas Vartabet. The original purpose was to supply the Gomidas Conservatory in Yerevan, Armenia with five practice pipe organs. Over the years the fund has sponsored events and gifted organs to Armenia and Armenian churches. The fund will continue to promote music of the organ until 2016. 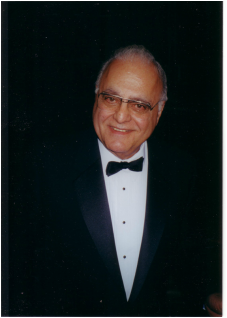 Berj Zamkochian was an Armenian-American organist. He studied at the New England Conservatory of Music and eventually joined the faculty. In 1957, at the age of 27, he was appointed organist of the Boston Symphony Orchestra and Boston Pops Orchestra. March 2015 - the Boston Symphony Orchestra under the direction of Andris Nelsons presented the world premiere of Ascending Light, a new work for organ and orchestra by celebrated composer Michael Gandolfi, written in memory of the late Berj Zamkochian. Learn more in the Full Program Notes (c) 2015. Used by permission of the author(s) and the Boston Symphony Orchestra. February 2003: Berj with baritone soloist Garegin Hovsepian, in Italy.